Thank you to everyone who was so kind in March – well over the last year or so actually. We know that a lot of people got some comfort from giving or receiving flowers, playing football or seeing the lovely messages over the last week. We also know a number of people were very upset at certain times around 13th March. Recalling the times from March 2011 – as well as feeling for Huw, we also feel for those who had to bear or receive the news. People were strong and compassionate a year ago, and remain so a year later. We don’t give up. We carry on. But we carry on in a different way. It’s not a case of coming to terms with what has happened, accepting it or moving on. Huw was much too important for that – perhaps it’s more a case of learning to live with it in some way or other. And it ‘s certainly a case of continuing to do positive things. Carys has had a good week at work experience, and will have a peaceful Mothers’ Day with Jenny. Nick has entered the Holmfirth Triathlon (at last) and ordered a road bike this weekend! 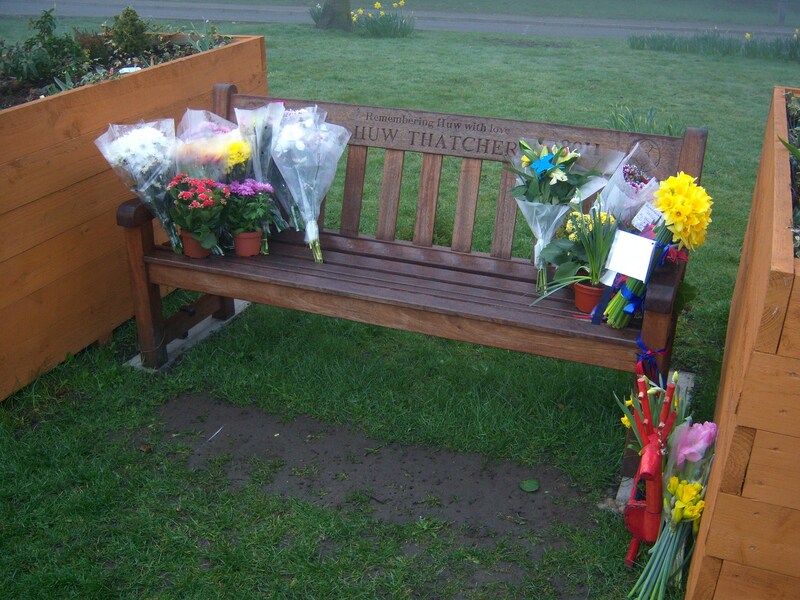 Thank you for the kindness as ever in March 2012 – for the lovely messages and thoughts about Huw. 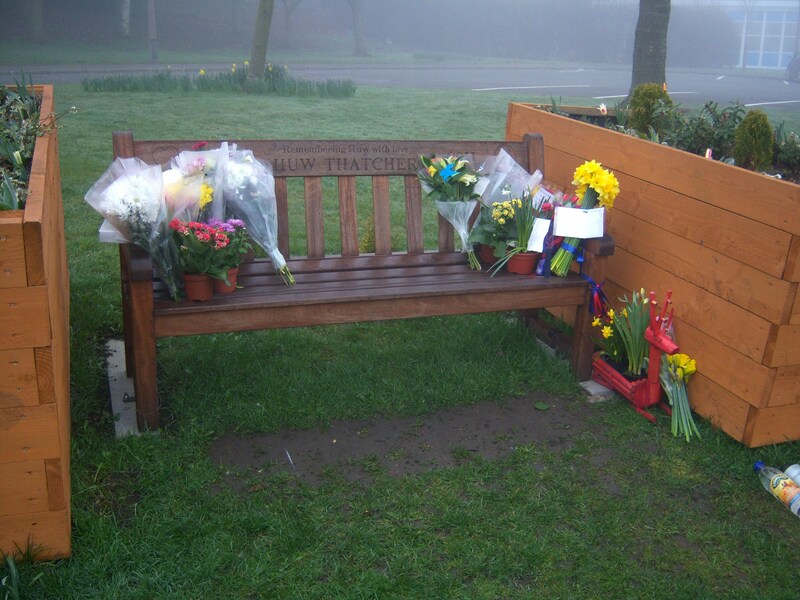 The flowers that were kindly left at Sands are a picturesque tribute to Huw and are pictured here along with the fog from last Wednesday morning. The Hepworth Dads and lads played football together at New Mill on 11th March – together like we were a year previously. It was the most appropriate thing we could all do and the fantastic spring sunshine and exercise made us all feel better – even if in the case of the Dads rather sore the next day! Thank you to everyone involved in playing, organising and lending moral support on March 11th – it was the best thing to do for sure. Every day has sad times, but a day never goes by without smiling about Huw as well, and usually smiling about his family or friends too. Whether it’s a text, Facebook post, a wave, a smile or something to do with Huw’s charity – there are smiles every day. The first Huw Trust event after 13th March was on Saturday 24th – the Sports Evening was like so many events over the last year. Sadness, but lots of pride, smiles and a good laugh. It was be a fantastic evening and Nick enjoyed seeing lots of old and new friends on the night. We are indebted to Jeremy Hoyle for working tirelessly to get every detail right. That night, like every night, Huw was carried along with us – never left behind, never forgotten, never left on his own, never brushed away because it is too hard to talk about. He will always be ‘out there’ with us – and loved just the same as ever.